Grenada Underwater Sculpture Management Inc. (GUSMI), in conjunction with Norwegian artist Lene Kilde, are proud to announce a new addition to the world–renowned Underwater Sculpture Park. The sculpture will be officially unveiled today, 15 December at 2:30 pm. at the Coyaba Beach Resort. The sculpture park at Molinere bay has attracted worldwide attention as the world’s first of its kind. The original sculptures were created by British sculptor Jason De Caries Taylor in 2007 as an environmental sustainability project to create new areas for corals, sponges and other marine life to grow and inhabit. To maintain the media’s interest in the underwater park, the volunteer management group has been working tirelessly trying to place a new sculpture in the area each year in an effort to spur further development, and expansion of the park. The new sculpture, is based on the fabled ‘Nutmeg Princess’, from a story by renowned Grenadian author Richardo Keens–Douglas. The tale is spun around a beautiful Caribbean princess who lives at Grand Etang lake. Ms Kilde, currently a recipient of a scholarship by the Norwegian arts council was inspired by Grenada’s underwater art and applied to GUSMI to make a sculpture for the park. Lene initially spent about two weeks exploring, experiencing and researching as much about Grenada as she could. This gave her the inspiration to create twenty designs from which ‘The Nutmeg Princess’ was chosen. The main construction material used is concrete, reinforced with heavy stainless steel wire. Special moulding materials were also needed to make some of the more detailed parts of the sculpture, such as the hands and the face. The sculpture is designed in two pieces: the first is the base, which is an enormous five foot nutmeg that contains two cubic meters of concrete giving it a weight of approximately seven tons. This considerable weight will create a stable base for the statue, which, when assembled will measure approximately ten feet high and will be expected to withstand the occasional rough sea conditions in the shallow waters of Molinere Bay. GUSMI, has already received excited interest in the new sculpture and requests for; how to support the group and the park. To this end, GUSMI would like to encourage donations towards the completion of this statue, and also future ones, which are already in the pipeline. For those interested in supporting the work of GUSMI and supporting the park please contact Howard Clarke for details. 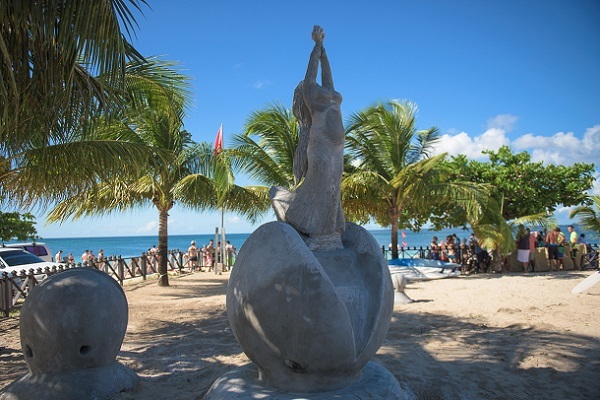 The sculpture is scheduled to be installed in the park in January 2015, and until then ‘The Nutmeg Princess’ will continue to be on display at the Coyaba Beach Resort, where it can be seen near the beach entrance close to Umbrellas Beach Bar.